290 head and stem combinations. Standard length stems range from 6–10 mm in diameter (in 1 mm increments) and 0–8 mm heights (in 2-mm increments), and are fully grit-blasted to promote bony ongrowth. The standard stems accommodate a resection window of 9 mm–17 mm. For very distal fractures or revision cases, the long stems range from 6–12 mm in diameter (in 2 mm increments), and have 50 mm–65 mm length options (in 5 mm increments). These stems accommodate a resection window of 19 mm–28 mm. 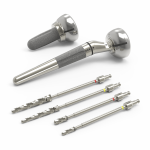 In addition to the Anatomic Radial Head System, the Acumed Acutrak 2 Mini and Micro instruments and the Locking Radial Head Plate System can be included in the tray to provide multiple solutions all in one set. 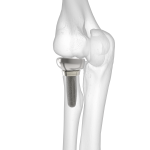 The first and only prosthesis intended to replicate the patient’s native radial head has been refined to include even more anatomic features. Several biomechanical studies have discussed the potential long-term value of an anatomically shaped radial head prosthesis. Heads range from 20–28 mm in diameter (in 2-mm increments). 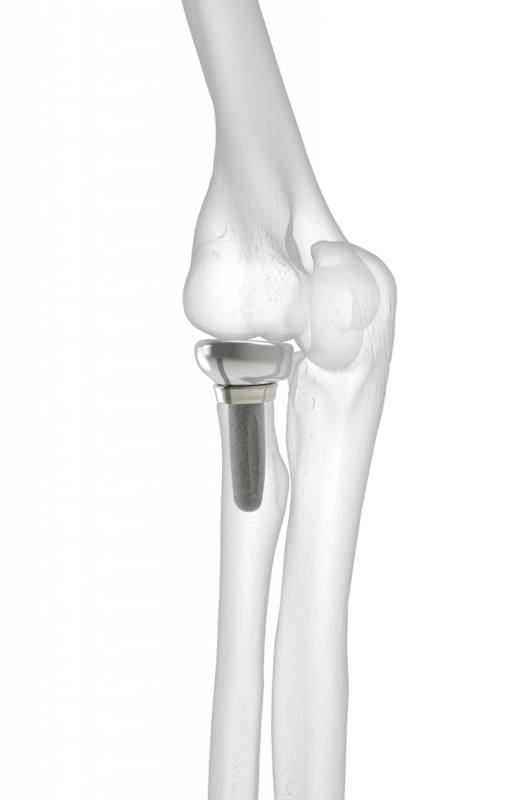 The Acumed Anatomic Radial Head System is designed to provide an anatomic implant to replace the patient's native radial head. 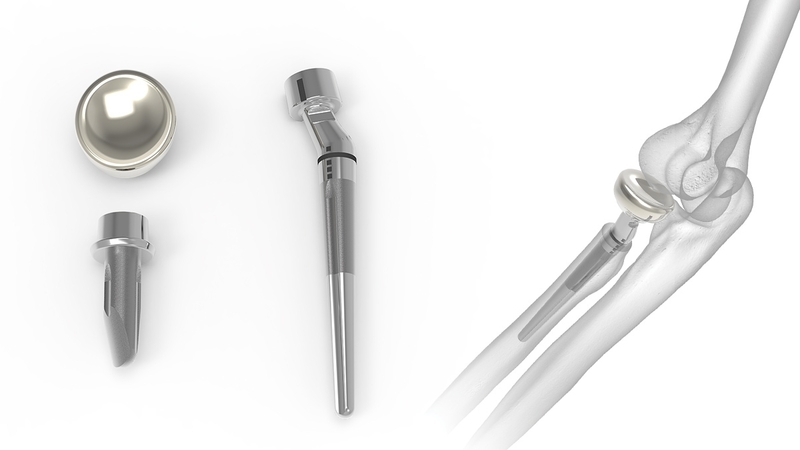 Designed in conjunction with Shawn W. O'Driscoll, Ph.D., M.D., the system includes 290 head and stem combinations including standard stems, long stems, an anatomically shaped radial head, and system-specific instrumentation to help streamline the surgeon's experience in the operating room. In addition to the Anatomic Radial Head System, the set may include the Acutrak 2 Mini and Micro instruments and the Locking Radial Head Plate System at the base of the tray to provide multiple solutions all in one set. This collection of published literature represents clinical evidence, which along with innovation, education, and quality form Acumed’s foundations of excellence. In addition to citing existing scholarly papers, we conduct ongoing clinical research and use this information for validation and continuous improvement to deliver the greatest value to our customers. mimicking native anatomy and if such pressures would be related to the depth and contour of the articular dish and to the pattern of prosthetic articulation against the lateral trochlear ridge. Three commercially available circular radial head designs were compared with an anatomical radial head and 2 modified anatomical prototype radial head designs in 10 cadaveric specimens. Each prosthesis and specimen combination was loaded in neutral rotation and maximal extension with a custom testing apparatus while measuring contact areas and pressures using thin-film pressure sensors. Anatomical radial head prototype 2 had similar radiocapitellar contact areas and mean pressures as the native radial head; all other designs showed significant decreases in contact area and increased mean pressures. Peak contact pressures were also measured and were significantly elevated with all prostheses tested. Anatomical designs are statistically more likely to mimic normal contact with the lateral trochlear ridge and its adjacent sulcus than circular prostheses. They are also significantly less likely to have contact pressures above the 5 MPa threshold that is thought to be harmful to cartilage. The depth of the articular dish had a significant effect on contact area and pressure. Commercially available radial head prostheses demonstrated reduced radiocapitellar contact areas and elevated contact pressures during compressive loading. These were significantly greater with symmetrical circular prostheses than with asymmetrical elliptical designs. The prosthesis that best mimicked native contact behavior was the anatomical radial head prototype 2 owing to its design for articulating with the capitellum, the lateral trochlear ridge, and the sulcus between. Bachman DR, Thaveepunsan S, Park S, Fitzsimmons JS, An KN, O’Driscoll SW. The effect of prosthetic radial head geometry on the distribution and magnitude of radiocapitellar joint contact pressures. J Hand Surg Am. 2015;40(2):281–288. 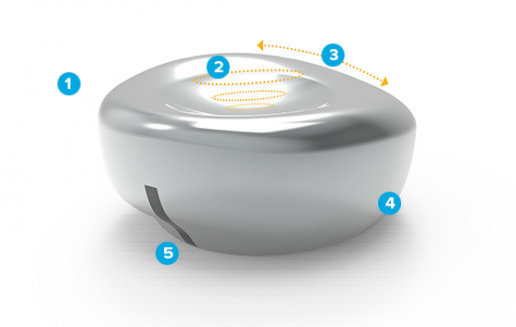 contact pressure and areas than nonanatomic implants. 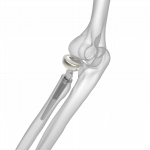 The distal humerus and proximal radius from 6 cadaveric upper extremities were serially tested in supination with 100 N of compression force at 4 angles of flexion (0°, 30°, 60°, and 90°). By use of a thin flexible pressure transducer, contact pressures and areas were measured for the native radial head, an anatomic implant, a nonanatomic circular monopolar implant, and a bipolar nonanatomic implant. The data (mean contact pressure and mean contact area) were modeled using a 2-factor repeated-measures analysis of variance with P ≤ .05 considered to be significant. The mean contact areas for the prosthetic radial heads were significantly less than those seen with the intact radial heads at every angle tested (P < .01). The mean contact pressures increased significantly with all prosthetic radial head types as compared with the native head. The mean contact pressures increased by 29% with the anatomic prosthesis, 230% with the monopolar prosthesis, and 220% with the bipolar prosthesis. Peak pressures of more than 5 MPa were more commonly observed with both the monopolar and bipolar prostheses than with the anatomic or native radial heads. The geometry of radial head implants strongly influences their contact characteristics. In a direct radius-to-capitellum axial loading experiment, an anatomically designed radial head prosthesis had lower and more evenly distributed contact pressures than the nonanatomic implants that were tested. Sahu D, Holmes DM, Fitzsimmons JS, et al. Influence of radial head prosthesis design on radiocapitellar joint contact mechanics. J Shoulder Elbow Surg. 2014;23(4):456–462. head prostheses is common but nonprogressive. In this study, we present a classification scheme to support our radiographic observations. We reviewed charts and radiographs of 86 cases from 79 patients with radial head implants from both primary and revision surgeries between 1999 and 2009. Exclusion criteria included infection, loosening, or follow-up of less than 12 months. We classified stress shielding as: I, cortical thinning; II, partially (IIa) or circumferentially (IIb) exposed stem; and III, impending mechanical failure. Of 26 well-fixed stems, 17 (63%) demonstrated stress shielding: I = 2, II = 15 (IIa = 12, IIb = 3), and III = 0. We saw stress shielding with all stem types: cemented or noncemented; long or short; and straight, curved, or tapered. 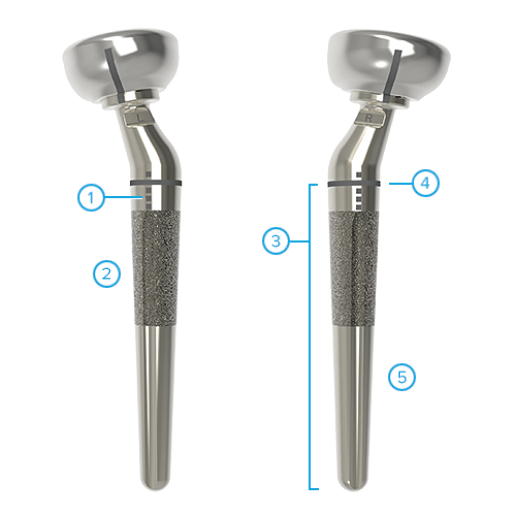 The only significant difference was that stems implanted into the radial shaft had less stress shielding than stems implanted into the neck or tuberosity (P = .03). The average follow-up was 33 months (range, 13-70 mo). Stress shielding was detectable by an average of 11 months (range, 1-15 mo). The pattern of bone loss was similar in 16 of 17 cases (94%), starting on the outer periosteal cortex. The 3 cases with circumferential exposure of the stem (stage IIb) averaged 2.6 mm (range, 1-4 mm) of exposed stem. Stress shielding never extended to the bicipital tuberosity, and there were no cases of impending mechanical failure. Stress shielding around radial head prostheses is common, regardless of stem design. However, it is typically minor, nonprogressive, and of questionable clinical consequence. Chanlalit C, Shukla D, Fitzsimmons J, An K, O’Driscoll S. Stress shielding around radial head prostheses. ASSH, 2012. Published by Elsevier, Inc. All rights reserved. 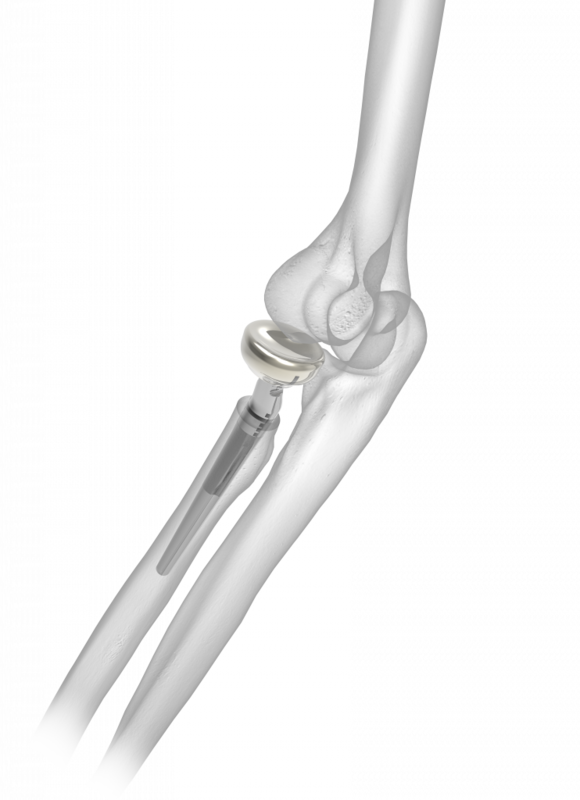 Originally released in 2006, the prosthesis has been used in thousands of radial head procedures over multiple system generations and product line improvements. More than a decade of research and experience has influenced key refinements to the anatomic properties of the prosthesis. With the annular ligament in mind, a more defined S-shaped contour has been added to the lateral side of the radial head prosthesis. 1. Bachman DR, Thaveepunsan S, Park S, Fitzsimmons JS, An KN, O’Driscoll SW. The effect of prosthetic radial head geometry on the distribution and magnitude of radiocapitellar joint contact pressures. J Hand Surg Am. 2015;40(2):281–288. 2. Sahu D, Holmes DM, Fitzsimmons JS, Thoreson AR, Berglund LJ, An KN, O’Driscoll SW. Influence of radial head prosthesis design on radiocapitellar joint contact mechanics. J Shoulder Elbow Surg. 2014;23(4):456–462. 1. 20–28 mm left and right specific heads. 4. Contouring of the medial side of the head has been further defined to track against the lateral side of the ulna. 5. With the annular ligament in mind, an S-shaped contour was built into the lateral side of the radial head prosthesis. 1. Hashed Laser Marks: Indicate proper alignment with the lateral aspect of the radius when the forearm is in neutral position. Lister's tubercle may also be used as a landmark for laser mark orientation. 2. Partially Grit Blasted Stems: Intended to promote proximal bony ongrowth. 3. 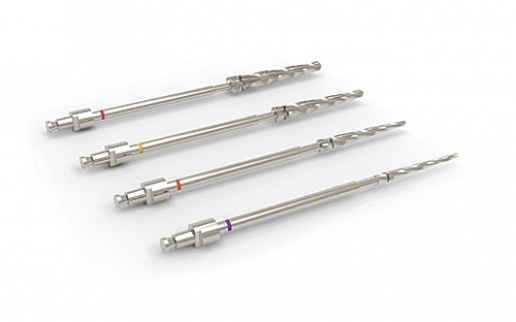 Resection Length: Four long stems accommodate resection lengths from 19 mm to 28 mm. The Long Stem Resection Guide is used to measure the length of resection, which corresponds to stem diameter. 4. Insertion Depth Laser Mark: Corresponds to the stem diameter and proper insertion depth based on equivalent level of resection. 5. Stem Length: Four long stems range from 50 mm to 65 mm in length (5 mm increments) and 6 mm to 12 mm in diameter (2 mm increments). 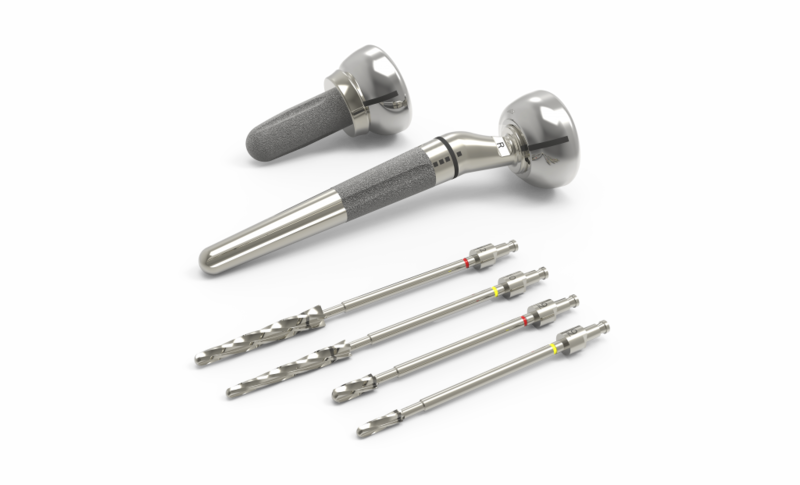 Stem Removal Tools - The ARH Removal Tool Shaft threads into standard and long stems to aid in stem removal during primary or revision surgery. The Cross Bar may be inserted through the ARH Removal Tool Shaft handle and be used as a surface for tapping the stem out with a mallet. 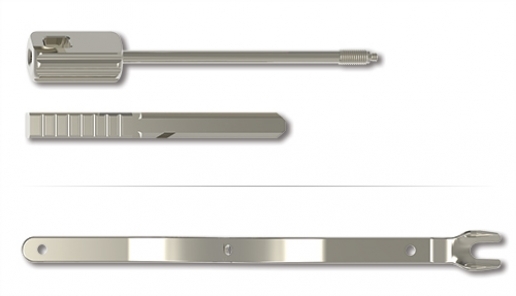 Radius Retractor - Designed to help elevate the radius, this tool may assist during reaming, trialing, and insertion of the implant. 1. Sahu D., et al.,Influence of radial head prosthesis design on radiocapitellar joint contact mechanics., J Shoulder Elbow Surg. 2014.23(4): 456–462. doi: 10.1016/j/jse. 2013.11.028. 2. Bachman DR, Thaveepunsan S, Park S, Fitzsimmons JS, An KN, O’Driscoll SW. The effect of prosthetic radial head geometry on the distribution and magnitude of radiocapitellar joint contact pressures. J Hand Surg Am. 2015;40(2):281-288.